Submitted by donaldb530 on Thu, 10/22/2009 - 1:11pm. All Walmarts,Sam's Clubs and Murphy USA gas/diesel in the USA and Canada. Gas/Diesel and No Over Night Parking (NOP) indicated if known be me or submitted as an update. Removed a WM in Morristown, TN that is closing. Finished update. 25 new or re-located WM's and Murphy's. Working on an update to web site: So far 12 new or relocated WM or Murphy's. 2 new/relocated Sam's: TX and MI. 1 new Walmart: AK. Added a Walmart in Wesley Chapel, FL. Corrected coordinates for Clermont, FL stores. New supercenter in El Paso. Finished update to web-sites. Plus 11 and minus 10. Added 4 locations in Canada. NS-2,, QC and ON. New Walmart in Hagerstown, MD. Removed the recently closed Sam's Clubs. 1 new WM in Kissimmee, FL. 2 new Walmarts - Las Vegas and Sacramento. Removed a Sam's in Manchester, NH and added 2 Walmarts - Phoenix & Henrica, VA. Deleted a Sam's in Exton, PA. Updated 2 sets of coordinates PA & DE. New Sam's in Hanover PA and relocateda Walamrt in Rexburg ID. 2 new WM's - AZ and VA.
16 new or relocated locations. TN-2, TX-9 and VA-5. 7 new or relocted. OK-3 and SC-4. 14 New or Relocated. ID, IL-5, IN, KS, KY-3, LA-2 and MD. 21 new or relocated locations. CA-3, FL-13, and GA-4. Added 2 Murphy's in AR. Added 5 WM's - 2 Hot Springs, AR; 1 Tucson, AZ and 1 Richmond, BC and 1 Tsawwassen, BC. 4 new Murphy's in AL and 2 Walmarts - Huntsville Nd Northport. New Sam's in Keller, TX and a new WM in Orlando, FL. New WM-Myrtle Beach, SC. 3 New SC's - Castle Rock, CO, Orlando, FL and Conway, AR. New Sam's - Brunswick, GA and Keller, TX. New WM Myrtle Beach, SC. New San's in Bluffton, SC replaces the Hilton Head store. Repaired file so it can be searched by store number. 2 new stores in TX - Tomball and Crowley. New Walmart in Derby, VT.
New Neighborhood Mkt in MS. Fixed problem with line 1. Sam's relocated 2 - CO and WI. Added 4 - FL, NC and SC-2. 2 new stores in TX. New Walmart in Burbank, CA. 3 new stores: AR, NC, and SC. 1 new location in WV and added 100+ Clinics. 28 more locations: PA, SC-3, SD, TN, TX-22. 5 more: CA, NM, OK, ON, and OR. 9 more new locations: CA-2, CO-1, and FL-6. 3 new WM's: FL-2 and GA-1. 2 new locations - AL & TX. Updated Canadian locatioons: 6 new and 1 re-located. 4 new Nbrhd Mkts. 2-GA and 2-SC. Added 4 Supercentres in Canada; QC-2, MB, & BC. Removed locations designated for closure. 2 new locations - CA and CO.
5 new locations - TN, NC, DC, and GA -2. 5 new stores: MN, TX, MO, AR, and WA. 4 new Neighborhood Mkts - TX, TN, LA and NC. Added 3 new or relocated Sam's - FL, CO, and MS.
2 new Neighorhood Mkts - SC and NC. Added 1 Sam's - TX, and 3 Walmarts - TX, SC-2. 5 new WM: AZ, TX-3, and VA.
6 new locations: CA, OK-3, ON, and TX. 5 new WM : AB, AR-2, AZ, and BC. 4 new locations - SC, NC, VA, and FL. 4 new locations - CA, LA, TX, and SC. 7 new locations - CA, MS, FL, AR, VA, TX, and NC. 4 new neighborhood mkts: AR, OK, VA, and SC. 4 new locations: LA, NC, VA, and FL. 2 new Sam's in TX. 12 new WM's:CO, CT, FL-6, GA-4. Updating to web site. So far net gain of 16 - AK, AL, AZ-2, AR-2, CA-10. Corrected Las Cruces, NM. I added 1 super and 24 markets. 5 new locations - AL, WA, MS, OK-2. 3 new or re-located Sams. 4 new Walmart Neighbothood Markets. 1 new Sam's and 3 Walmarts. 6 new stores - OH, NY, CA, and GA-3. Added 2 in CA and 1 each in NC and SC. Added 11 mores stores. Also worked on (NOP). Compared 3 different data bases. Did not include Neighborhood Markets. Tweaked 5 and I added 6: MA, TX-2, CA-2, and IL. 15 new stores in 10 states. 2 new locations in CA and 1 in VA.
4 new Canadian locations: 3-ON and 1-AB. Added 14 Canadian stores: 3-AB, 1-BC, and 10-ON. Sorry, had an = instead of - in front of a couple Longatudes. Added 5 Neighborhood Markets to the Denver area. Added stores in Berlin WI, Springfield MO, Red Oak TX. Checked all the Sam's and tweaked quite a few coordinates. Added or changed 1 Sam's and 3 WalMarts. Tweaked another 20 sites in the southeast. Corrected Granville and Morgantown WV stores. Moved the Dover DE store to a new address and corrected a store in Rochester NY. Corrected Clayton GA and Kalispel MT. Also added (NOP) locations. Added 5 new Neighborhood Markets in Wichita KS. Added new stores in Winchester VA and Hammond IN. Added stores in Durham NC, Dunedin FL, Orlando FL, Boynton Beach FL and Fairfax VA.
New locations in Lima OH, Iowa City IA and Johnsburg IL. Added or relocated 6 locations in NC, LA, GA and FL. Verified that all Wal-Marts with gasolene have been updated. Beardstown IL, Punxsutawny PA, Duncansville, and Rapid City SD. Added Sam's in Riverview FL, Sharpsburg GA, and Rapid City SD. 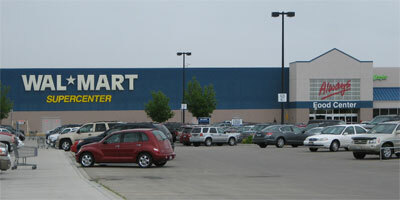 Added Wal-Marts in Woodland WA and Pullman WA. Added Sam's in Temple & Denton TX. Finished Adding Interstate exits. Added a WalMart in Lynchburg, VA and working on adding groceries to remodeled "WalMarts"
Updated location of Victoria, BC and Leamington, ON stores. After much discussion, I will return to .csv format. Reported a store closing in Louisville, KY and modified locations for 2 other stores. Submitted changes for Clarkston; moves the store accross the state line from ID to WA.